Newspaper Stand, 2018, replenishable newspapers and metal stand, dimensions variable. Newspaper stands like this are regularly associated with busy commuter rail or bus stations, distributed for free and easily available on the move. At the seaside, newspapers have a more leisurely association, where the classic British supper of fish and chips can still be purchased in a newspaper cone. For a large proportion of transgender people however, newspapers have a more negative connection; mainstream media outlets often ignore important stories affecting the transgender community and publish harmful, misinformed, or prejudiced articles instead. Created in response to this, Stop The Press is a guide for taking action against these papers, calling out publishers of hateful articles and protesting against those which continue to misinform the general public. It also offers suggestions for how the public can support transgender people, useful places to conduct their own research and helpful links to support groups for those that might need them. Playing with the history of pull-out centre spreads, Stop The Press can also be displayed as a poster to show solidarity with the transgender community. 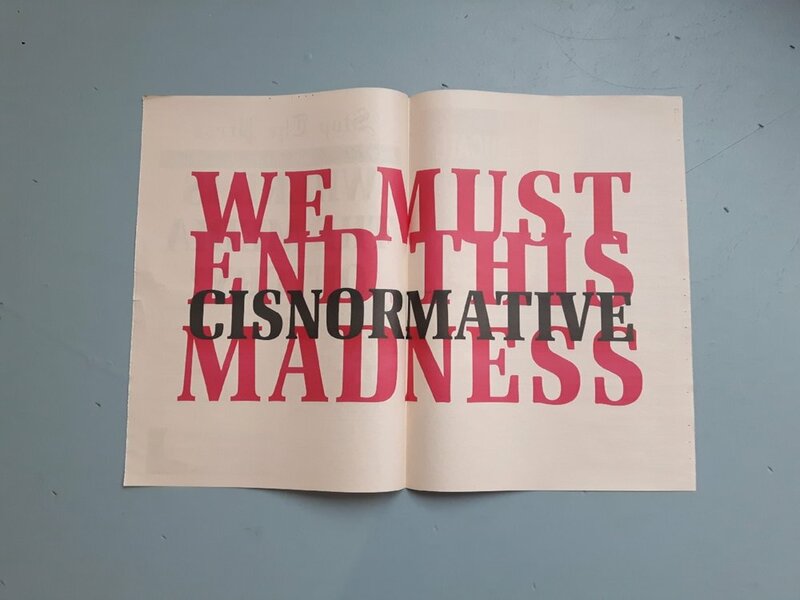 The slogan ‘WE MUST END THIS CISNORMATIVE MADNESS’ has been adapted from a transphobic article originally published by the Daily Express, repurposed here as a direct critique of this papers xenophobia.